We welcome adult members of all abilities. Annual membership runs until March 2020. We now accept online payment only. Use the following link to join Brecon Triathlon Club and pay your membership fee. Fill all fields especially your postcode. If you have any special needs or requirements then please feel free to discuss with the Club. Use the contact form and we will be in touch as soon as possible. Thank you. An email will be sent out in March asking if you would like to affiliate to Welsh Athletics (£17.50) - this will be billed separately. Welsh Athletics membership is optional, but has many benefits - see here - £10 off entry to the Lloyds Bank Cardiff Half Marathon is notable. You will also be eligible to enter running races as an accredited club runner (Brecon Triathlon Club); usually there is a saving of around £2 - £5 per race. Club membership does not include Welsh Triathlon membership and race license. To compete in triathlons you will need to buy a day license for each race or annual Welsh Triathlon membership. As well as race insurance, this also includes insurance for you whilst training. Annual membership may be better value depending on how much you compete. 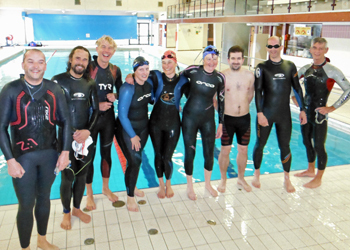 Club members receive a discount on Welsh Triathlon membership of £11. We have no Junior section (over 18s only). to review and update the details we hold on file.